For qualified lubricant wholesalers who have customers who sell to Hot Rods, Sprint Cars, Midgets, Modifieds, Drag Racers, Road Racers, Off-Road, Diesel Pullers, etc., Champion Oil has recently announced new opportunities available in the Northwestern United States. Inquiries should be from established businesses interested in acquiring this technologically advanced, extremely popular, highly profitable, and track proven racing and performance line of products. Champion Racing Motor Oil contains Champion’s proprietary TVS® (Thermal Viscosity Stabilizer), special lubricity modifiers, and a premium level of anti-wear additives which includes a high quantity of ZDDP. These additives are proven to meet the lubrication demands of competition engines, create a tough film strength, which controls wear and provides more horsepower and torque in Dynamometer testing. Champion Racing Oils are suitable for use in all competition and race engines especially those using flat tappet and/or roller cams operating at high RPM’s and requiring high-pressure valve springs. Champion Classic Blue Flame® Performance Diesel Oil is a unique hybrid synthetic blend 15W-40 diesel engine oil that combines workhorse high-zinc performance additives, superior protection, advanced polymer technology, and high TBN, supported by a carrier blend of synthetic and conventional base fluids. Performance diesel owners have reported decreased cylinder, cam, and bearing wear in their early model engines, especially in competition diesel engines. Development of this oil included attention to the concentration and synergistic behavior of anti-wear and detergent additives in an effort to obtain more robust protection at high temperature and heavy load. About the company: Champion Brands, LLC, is a globally recognized industry leader in specialty lubricants for over 55 years. 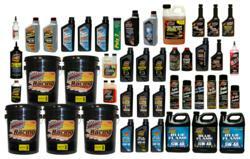 Champion Brands, LLC also produces and blends over 300 products including fuel, oil, engine additives, and lubricants for the racing, automotive, heavy truck, agricultural, industrial, and specialty markets. For more information call Champion at 800-821-5693 or 660-885-8151. Champion Brands, LLC; 1001 Golden Drive, Clinton, MO, or go to http://www.championsusechampion.com.